Cornell has long been the national leader in fusing technology education and research with other fields of study as wide ranging as psychology and economics. More than a decade ago Computing and Information Science (CIS), a college-level unit that spans traditional college boundaries, was created with the mission of bringing computing technology into every discipline. The result has been the melding of two separate intellectual and practical approaches – the technical and the social – in ways that result in innovative, creative solutions to complicated problems. Today, CIS comprises three complementary departments: computer science, information science and statistics, with 80 affiliated faculty. Our programs reach thousands of Cornell students across multiple colleges who work side-by-side with faculty, researchers and corporate partners. 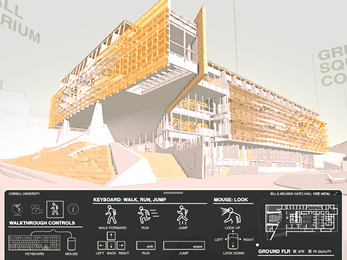 From our work in human-computer interaction to computer-aided sustainable design, CIS has become emblematic of the broad collaborative ties between technological and non-technological disciplines at Cornell. Our vision for CIS over the next few years is a bold one: to be the national model for education and research that supports the information economy. One of the ways we will achieve this is by creating an intellectually stimulating environment conducive to collaboration and innovation. Critical to our efforts to increase collaborative ties among our students and faculty is a physical space that unites our core departments, inspires creativity, enables team-based project work, and fosters cross-college interactions. Our new space – Bill & Melinda Gates Hall – will reflect the essence of the information age through its integration of technology and architecture in its open and outdoor spaces, classrooms, labs and offices. Bill & Melinda Gates Hall, the future home of the CIS departments of Computer Science and Information Science, was fully funded with no additional debt before the first shovel hit the ground. Starting with a generous $25 million donation from the Bill & Melinda Gates Foundation, fundraising for the $60 million project concluded in the fall of 2010 with donors from almost every Cornell college. Groundbreaking for the new building, located at the corner of Hoy and Campus Roads on Cornell University’s Ithaca campus, was in early April 2012. Construction is expected to conclude in December 2013. Morphosis is an interdisciplinary practice involved in rigorous design and research that yields innovative, iconic buildings and urban environments. With founder Thom Mayne serving as design director, the firm today consists of a group of more than 50 professionals committed to the practice of architecture as a collaborative enterprise. With projects worldwide, the firm’s work ranges in scale from residential, institutional, and civic buildings to large urban planning projects. In addition to Bill & Melinda Gates Hall on Cornell’s Ithaca Campus, Morphosis was recently chosen to design the first academic building on Cornell’s new Roosevelt Island CornellNYC Tech campus. Perhaps best known in New York for its sculptural and futuristic Cooper Union Arts and Sciences building, it’s Cornell buildings are sure to become upstate-downstate high-tech icons.